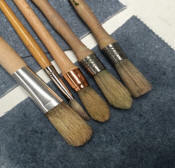 When using large brushes the problem is usually the drying of them. If you use kitchen towel, it becomes just a soggy mess; an old tee-shirt just gets sodden, so what do you do? The Absorbant Mat measure 40 cm x 48 cm (16" x 19") and will soak-up and hold about 1 Litre of fluid, they're re-useable and are made from 75% recycled material. Wash the brush in the normal way, squeeze the fluid out of the brush by pressing against the side of the container, dry the brush across the Mat whilst shaping the bristles. Squeeze the fluid out of the Mat back into your brush-washing container, hang the Mat outside to dry, reuse when dry. 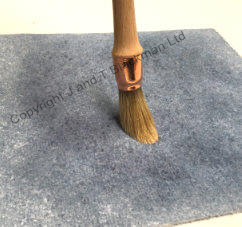 Try to use the Mat for drying the brush, rather than cleaning the paint/wax off the brush, because, that will spoil the Mats absorbant qualities. 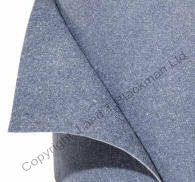 The Mat absorbs oils and solvents and for added safety it is treated with a fire retardant. 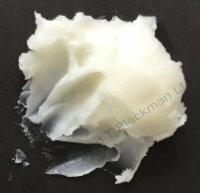 Not for use with acids, caustic or other corrosive liquids. When using smaller brushes cut the Mat into four pieces if more convenient, better than wetting the whole Mat per painting session. The Mat holds the fluid, so very little evaporates into your work space or the atmosphere. The Mat is designed with in-built wet-strength, therefore, a fully drenched Mat will remain intact and stable when being moved. Economical, reusable, good for your work space and the environment.